Last week, I worked on another alternate block. Then sewing a few more 6 inch blocks for the back of my quilt. No, sir, the back. I am sewing and designing the back of my quilt. Sir, I fully expect to see the front and back of this quilt when in use sir, I want to be able to enjoy both, sir. I slept sir. One day. Was exhausted sir, I needed to rest sir. Not true! The other days I worked on fabric acquisition, assimilation and integration sir. 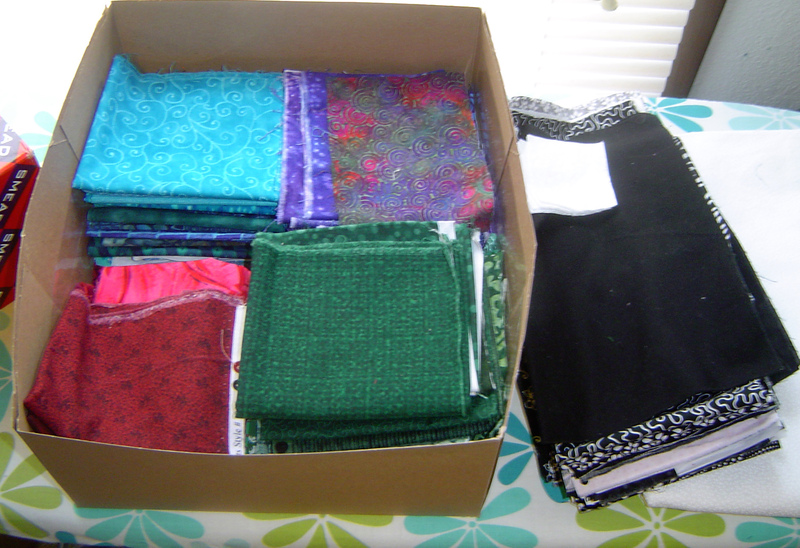 Integration – ironing, folding and sorting fabric. I decided to make a fake quilt sir. 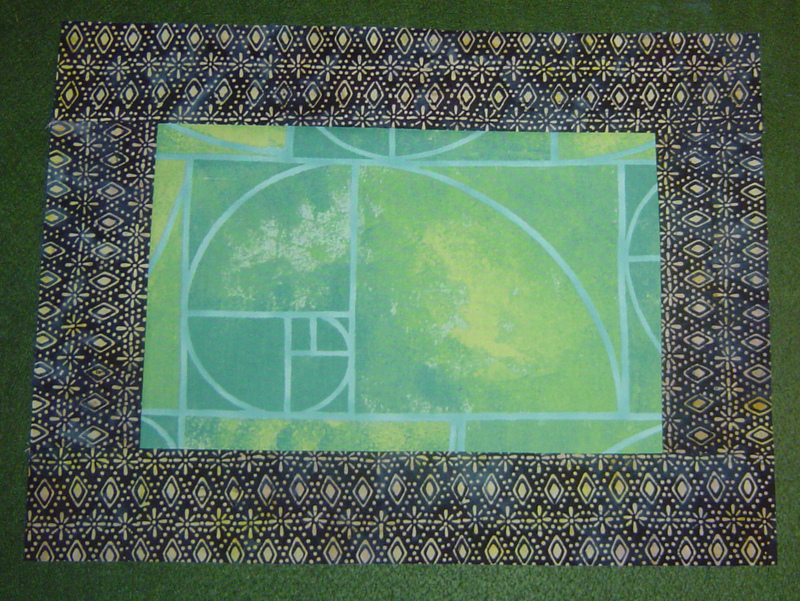 I used a Fibonacci print and I cut it out of the fabric. And I put a border around it. Yes, sir, just up and decided to use the fabric sir. There were so many stacks. So many stacks of scraps. I don’t know how this is going to work, sir. The box filled with scraps and blacks and white is full even before adding the sample block and instructions. Yes I could acquire a better scrap storage system to pass around as a pizza box. 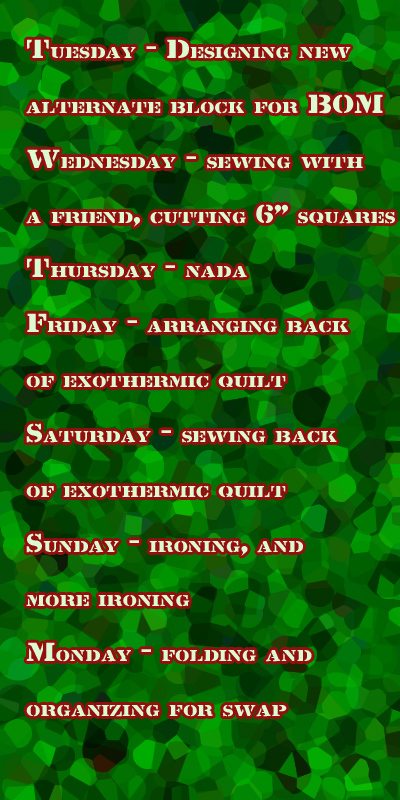 Sir, I realized that ‘providing a majority of fabrics’ for a scrap quilt isn’t all that much fun because you have so much to anticipate for others to use together for several months into the future. Oh yeah, here’s the link to Life in Pieces. That’s quite a week. Love your fake quilt! Good luck with your scrap storage delimina. Hi Darla, Congratulations on your 40th episode! That is a lot of entertainment for us. Thank you for all you do. I enjoyed the March a long even though I wasn’t very good about reporting in on a consistent basis. I’m surprised that you’ve only been quilting for 3 years! Think of that huge list you gave us of all of the things and decisions involved in quilting…… you’ve come along way.